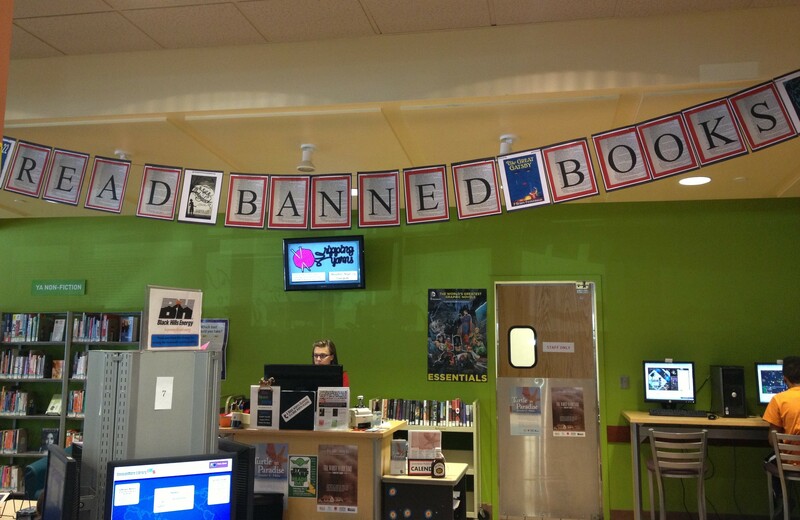 Happy Banned Books Week! 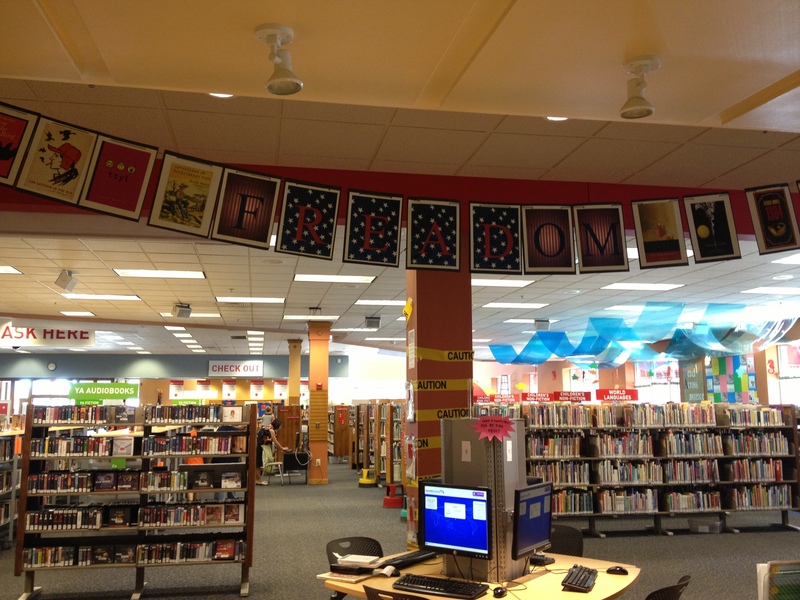 I’m been super busy with both the public library and my internship at a school library, hence less posts here than normal, but I wanted to take a moment and share what I’ve been up to for Banned Books Week. I’ve had trouble with putting posters on the green wall in our temporary space while the library is being renovated. Remember that “out and about” road trip books display I made this summer? It was constantly falling down because the air conditioner vents blow down that wall from the ceiling. So I I got the idea to hang a banner along the center of the teen zone away from the air vents. Putting together a banner like this one is so simple, and I love that it can be easily stored and reused. I just made the letters in Publisher, printed off book covers, glued them together on each side of a piece of cardstock, punched two holes in the top, and ran string through them. The only tricky part is laying them out so the letters are in the right order on each side. If you do it as pictured above, you won’t have any mishaps (like I did in my first attempt). I also put together a display of shredded banned books. It’s self-directed (passive) programming as well. There’s a sheet where teens can match the deconstructed books in the bags with their covers and reasons for being banned. When it was going up up Saturday evening the kids were already intrigued. I love that it allows them to interact with the books and highlights the reasons for challenges to popular titles. Instead of running an actual book through a paper shredder, like I did when I originally tried out the idea, this time I ran photocopies of a portion of the books and cut it with a papercutter. The school librarian didn’t go for the shredded books idea, so the self-directed (passive) programming activity is instead matching quotes from banned books with the title and cover. Still fun. I love quotes, and banned books are full of great lines. We’re also having a Read Out, where teens we film reading from their favorite banned books and featuring another round of Banned Book Trading Cards, fun community project. It may just be one week, but we’ve got a lot going on! Banned Books Week might be my favorite week in the library. Perhaps because it signals the start of the fall season? More likely because most of my favorite books have been banned or challenged at one point or another. For those who don’t think it’s relevant, or assume that everyone in America has the freedom to read what they choose, I’d point you to Kelly Jensen’s round up of the books challenged in the last month over at Book Riot. Most challenges happen in public schools. As regular as these types of challenges are, the discussion of censorship and intellectual freedom should extend to the books that don’t get purchased because they might be too controversial for a community or the books shelved in an office and requires parental permission to check out. Banned Books Week is all about celebrating the freedom to read, and so I’m off to sneak in a couple hours doing just that. In fact, I’m just about to start Laurie Halse Anderson’s SPEAK, which has seen its fair share of challenges. Thank you for sharing your passive program for banned books week. I am preparing for an Escape Room at the end of September 2017, and I like this passive program! I think I would use the worksheet as a clue, and they would need to find the display (if they hadn’t seen it before) in order to potentially solve the worksheet. The numbers could then be used to unlock one of the locks! Super idea! I will steal it and use this year in my library! Thanks for sharing! I am working as Librarian at School library in Bangalore, Karnataka, India. I need some wall posters for our school library. Can you send same to my email id. Hmmm…I’m not sure what you are needing or that I have access to it. Sorry! The display looks great, Molly! As you say, these types of challenges are common. It’s a tough issue because all libraries and school boards must make decisions about whether to purchase a book, and content is obviously a factor. However, I do wish our laws were a bit more protective of the speech contained in books. The main case on it is over 30 years old, a plurality decision (so not a majority), and one that a circuit court decided not to follow in 2009 (and so allowed a book to be banned due to “inaccuracies,” which I think is a vague enough term that could apply to almost anything!). What’s particularly concerning to me are all the books about so-called “non-traditional” families that get challenged, as though reality is inappropriate for children (I discussed these issues on my blog when I talked about The Family Book and And Tango Makes Three last year). Ugh. I hope that these types of discussions and displays will raise awareness about the harms of censorship and the importance of free speech. I also hope it will encourage people to start paying more attention to who our judges are. I always love hearing your opinions from a legal standpoint.